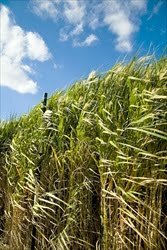 A blade of grass destined to be converted into biofuel may join energy efficiency and other big-ticket strategies in the effort to reduce atmospheric carbon — but not in the way that you might think. Miscanthus, a potential feedstock for biofuel, could pull double duty in the fight against climate change by sequestering carbon in the soil for thousands of years. Sounds promising. But should scientists genetically engineer bioenergy crops to be better at ridding the atmosphere of the greenhouse gas? And can this strategy take place on the scale needed to mitigate climate change? These questions are framed in a new analysis by Lawrence Berkeley National Laboratory scientist Christer Jansson and researchers from Oak Ridge National Laboratory. Their research, published in the October issue of Bioscience, explores ways in which bioenergy crops can become a big player in the drive to rein in rising levels of atmospheric carbon dioxide. The authors hope to get others thinking about engineering plants to not only produce biofuel, but to also sequester carbon. The conversation has already started. Scientific American and other news outlets and blogs have published articles on the team’s analysis since it was published a few weeks ago. At the heart of the scientists’ analysis is the idea that bioenergy crops can fight climate change in two ways. There’s the obvious way, in which a plant’s cellulosic biomass is converted into a carbon-neutral transportation fuel that displaces fossil fuels. And the not-so obvious way: bioenergy crops also take in atmospheric carbon dioxide during photosynthesis and send a significant amount of the carbon to the soil via roots. Carbon from plant biomass can also be incorporated into soil as a type of charcoal called biochar. Either way, the captured carbon could be out of circulation for millennia. At stake is the urgent need to make a dent in the nine gigatons of carbon that human activities emit into the atmosphere each year (one gigaton is one billion tons). Natural processes such as plant photosynthesis annually capture about three gigatons of carbon from the atmosphere. As Jansson explains, to increase the capacity for plants to act as carbon sinks, scientists need to continue to develop bioenergy crops that are efficient in harvesting light energy and using the energy to convert carbon dioxide to biomass. Bioenergy crops should also have a high capacity to send the carbon it captures to its roots, where it has the best chance to be stored in soil for thousands of years. Fortunately, top bionergy crop candidates, such as Miscanthus, are already better-than-average carbon sinks. The large root systems in perennials such as grasses make them better at sequestering carbon in biomass and soil than annual plants. But can bioenergy crops become even better? Jansson and colleagues outline several possibilities in their analysis. A plant’s canopy can be altered to enhance its efficiency at intercepting sunlight. Another approach accelerates a plant’s photoprotection mechanisms, which would improve its ability to use light. And a plant’s tolerances to various stresses could be improved without compromising yield. A game-changing success, Jansson explains, could be the design of a bioenergy crop that can withstand drought and which utilizes brine, saline wastewater, or seawater for irrigation to avoid having to tap into freshwater supplies. Jansson suggests that genetic engineering can play a key role in introducing these traits into a plant.